Teachers Network provides lesson plans, classroom specials, teacher designed activities for different subjects and many other resources. Smithsonian Education offers a wide variety of free resources for teachers, students and parents. This is another great website for teachers. It provides teaching tips, lesson plans, activities, academic articles, web resources and many more. This is one of the oldest publicly accessible U.S repositories of education resources on the web. It contains a variety of educational resource types from activities and lesson plans to online projects to assessment items. EdHelper provides teachers with free printables, graphic organizers, worksheets, lesson plans, games and many other activities. This is a great website that can help teachers grow professionally. It offers free teaching resources relevant to different grade category. 42explore is a web project that provides resources and teaching materials on different subject areas and disciplines. This is a teacher-created site designed to help teachers find online resources more quickly and easily. It provides lesson plans, thematic units, teacher tips, discussion forums for teachers, downloadable teaching materials, printable worksheets and many more. This is a rich collection of lessons, untis, and web resources designed to save teachers time by delivering just what they need in a practical, user-friendly, and ad-free format. This is another awesome website for teachers. It includes free resources on different sujbect matters as well as articles and tips on teaching and learning. 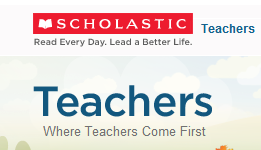 Scholastic is a great website that provides a lot of different resources for teachers, parents, kids, administrators, and librarians. Teach Hub provides k-12 news, lessons and share resources created by teachers and shared with teachers. This is an excellent website that empowers and connects teachers, administrators, and parents with innovative solutions and resources to better education.